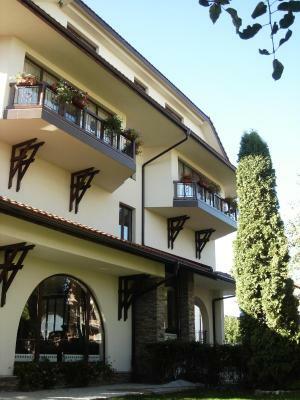 Zagotovite si odlično ceno v nastanitvi Boutique Hotel L do Rado - gostje so ji podali oceno 8,9. The owner was extremely friendly, helpful and a pleasure to talk with. The room was spacious, modern, with a good quality bathroom and a comfortable bed. Breakfast in the morning was delicious and varied - a very nice experience for our first time in Bulgaria. The room was big and comfortable and clean. The patio with grass is very nice for kids. The staff were very helpful and friendly and the hotel rooms were spotlessly clean. The prices were very good ( less than 100 euros for three en suite double rooms ). We always try to stay here when we arrive in Sofia before travelling to other parts of Bulgaria. The food in the restaurant is great ( try the lamb St George ). Don't be put off by the name ( El do Rado ) - this is a lovely Bulgarian run hotel! Situated in Sofia City, the modern Boutique Hotel L do Rado offers elegant rooms and a stylish restaurant with a summer garden serving traditional cuisine. Free Wi-Fi is available in the entire hotel. Rooms and suites at the L do Rado feature a seating area, a desk and a minibar. Private bathroom provides a shower and free toiletries. The nearest bus stop is 50 metres away. The very centre of Sofia can be reached within 9 km. Sofia Airport is 4 km away. The Expo Centre is 1.3 km from the Family Hotel, and Business Park Mladost can be reached within 3 km. Boutique Hotel L do Rado gosti Booking.com uporabnike že od 28. feb. 2012. Kdaj želite prenočiti v nastanitvi: Boutique Hotel L do Rado? Rooms featuring cable TV and a minibar. A bathroom with bath or shower and a hairdryer is available. Some rooms have a terrace. Spacious suite featuring cable TV and a minibar. A bathroom with bath or shower and a hairdryer is available. Luxuriously furnished rooms featuring cable TV and a minibar. A bathroom with bath or shower and a hairdryer is available. Some rooms have a terrace. Rooms featuring cable TV and a minibar. A bathroom with bath or shower and a hairdryer is available. Luxuriously furnished suite equipped with a fireplace and a spa bath in the living area. Cable TV and a minibar can also be found in the suite. A bathroom with a spa bath and a hairdryer is available. Hišni red Boutique Hotel L do Rado sprejema posebne zahteve - dodajte jih v naslednjem koraku! Boutique Hotel L do Rado sprejema te kartice in si pridržuje pravico do začasnega zadržanja sredstev na kartici pred vašim prihodom.